How does your bedroom “feel”? Is it a place to go to sleep or does it have a special ambiance? It is a place to dream and allow your mind to wonder or does it have the opposite effect? Romantic environments have a soul that permeates through to give you time to escape from the outside world and connect with an intimate side of yourself. The scent of fresh flowers, the glow of soft lighting and candles intertwined with soft, touchable textures. With an ocean view, this sunlight filled room overlooking a beautiful pool area had the potential to look gorgeous and luxurious and feel like the perfect feng shui bedroom. 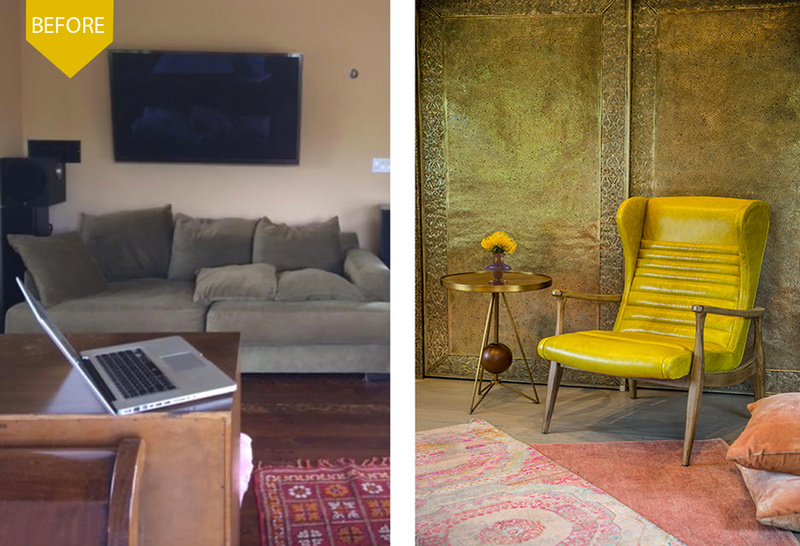 The challenges to this room are evident in the before shots (click through the images above). There were the heavy structural beams, dark floors and somber colors. All together, I was excited though because the room would make for an opportunity to do a dramatic makeover. We began by figuring out how to structurally remove the beams and add a balcony, turning the large windows into french doors to maximize the enjoyment of the serene view. With my clients love of the Moroccan style, this was the perfect opportunity to create a lavishly romantic oasis, starting with lighten the pallet to allow the focus to be on the dance of color and textures. Once the two heavy beams were out and the balcony was in, I designed a wonderful canvas to offset colors that would enliven the senses by wrapping the room room in sumptuous pale gray hues seen in the wooden cladding on the ceiling, the stone lined wall and white floors which were beaten with chains in the refinishing process (literally) to create more of an old world style. To capture the perfect romantic, feng shui bedroom feel, I gathered colorful hand dyed velvet pillows, custom fringe lined curtains and silk layered rugs for a wonderful play of exotic colors, textures and patterns. Everything needed to have a tactile feel to the touch. The bed and metal wall was an adapted design that I reworked and had made with Badia Design in Morocco. Each item was specially curated to give the feeling of being transported into another world. While the room is quite large, I never wanted to loose site of the feel I wanted which could be far more intimate and spa like. The end result is a sublimely romantic bedroom that is perfect for a dreamer. My client has their own sanctuary to escape from the outside world. Join our creative community to get tips, inspiration, resources and private invitations to our upcoming events.